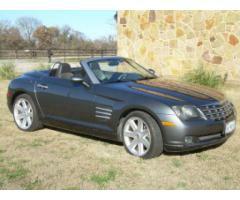 2005 Crossfire Roadster Convertible Limited is Graphite Metallic in color. The crossfire has been kept clean and stored in the garage. Only driven on nice days, no rain or snow. The leather interior is light and dark gray, showroom clean and supple. The brake and gas petals show no sign of wear. There is only 81,739 miles on the Crossfire. The sound system is awesome. The convertible top is in excellent condition. The car is in above average mechanical condition and the motor is showroom clean.